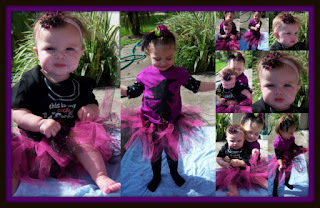 I love the outfits/costumes I received for Elizabeth and Sarah from Marie owner of TooTooCuteTutu on Esty. I couldn't believe how cute the outfits were! Elizabeth loves hers, she wouldn't sit still so I could get a really good pic she kept spinning round and round. 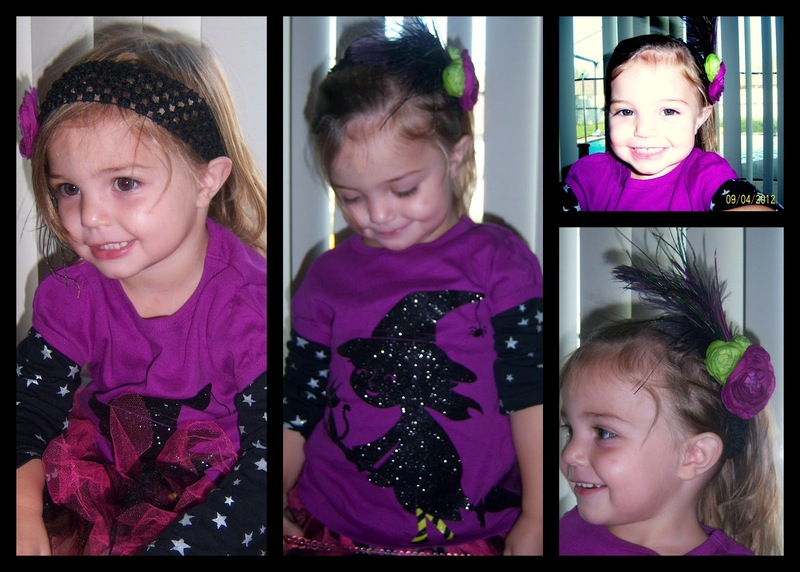 Elizabeth's tutu was a cute black and pink tutu, paired with a Carters purple long sleeve witch shirt that was a size 3t. The shirt is a bit big but will be perfect for her in the winter which is what I requested. I love how Marie made the tutu, she was smart and made it on a headband for the waist which allows for growth. The headband that Marie made was beautiful it is a nice dark purple flower with a green accent along with a few black feathers, on a easy to place headband. Love it! I paired Elizabeth's Witch outfit with a pair of black tights which I would have used leggings but have seemed to misplace them. Elizabeth loved the outfit and wore it the rest of the day. I was able to get a few more pics later of her in the outfit. 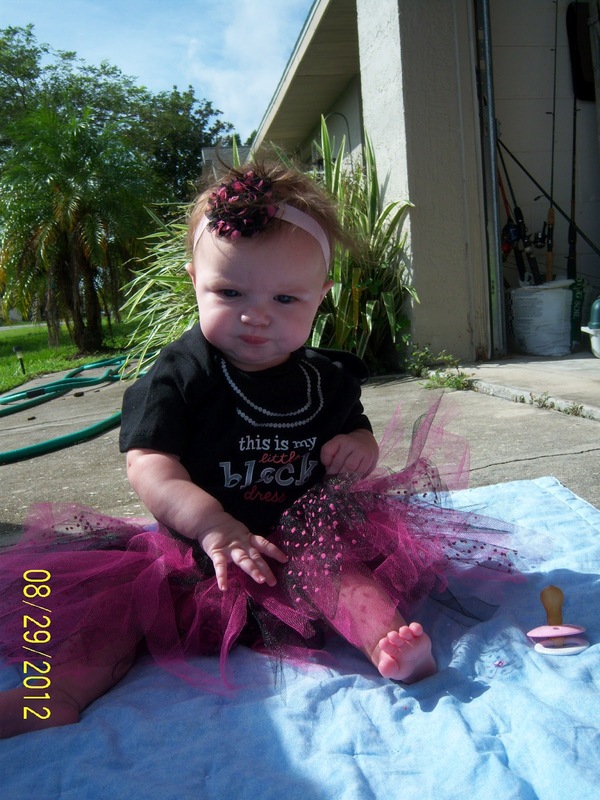 The outfit sent for Sarah was a black onesie from Faded Glory that reads "My little black dress" which has a pearl necklace printed on the onesie as well. Sarah's outfit is very cute it's 3 pieces, the onesie, a pink and black polka dot tutu with a pink band, and a cute single flower headband. Sarah worked with me so I was able to get some shots off before she'd had enough. I love how I can change tutu's between daughters if I want and come up with new outfits. I like how easy they were to get on. Marie's prices in her shop TooTooCuteTutu are crazy cheap compared to many others, you get a full outfit for what most would pay for a tutu. 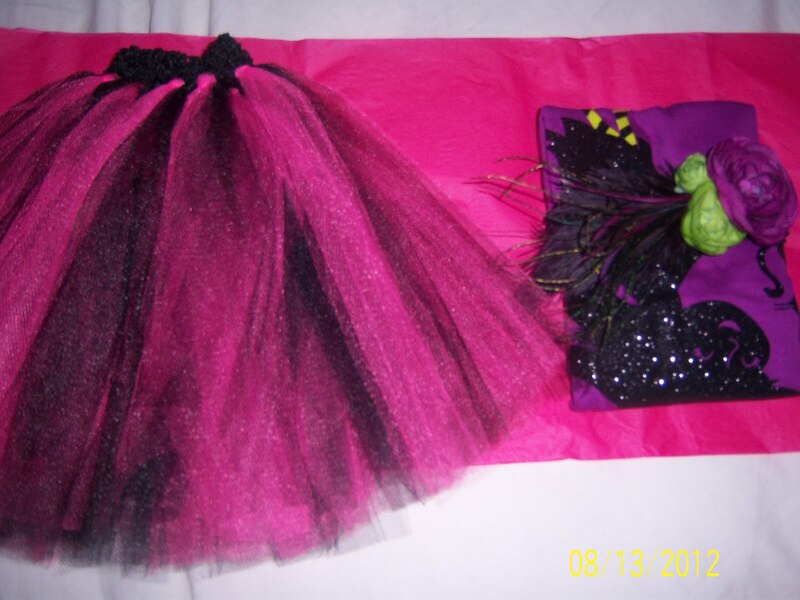 The prices are anywhere from $8-$25, she sells also cute beanies for boys, hair bows, and of course the tutu sets. 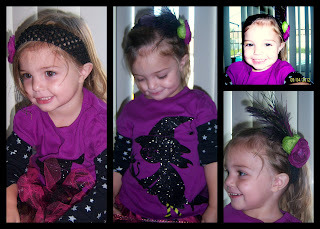 I love the outfits she has made for my daughters it will be a fun thing for the Halloween season. So if your looking for something new check out Marie's store on etsy at TooTooCuteTutu. I love love love this http://www.etsy.com/listing/103230295/this-is-my-little-black-dress-tutu-set! financing world, the major players bank around the idea that 99% or even more of potential prospects will just stick to the crowd guaranteed bad credit loans this very factor makes payday cash advances online open to people who are in real necessity of funds.